Constricting snakes, commonly referred to as "boids" (members of the the taxonomic family Boidae), are a diverse group of snakes. There are several varieties that are popular as pets and while some may be fine for beginner snake owners, several are not. These snakes share a common trait of killing their prey by suffocation, but there are significant differences in habitat, natural history and care requirements. While the terms boa and python often bring to mind large killer snakes, this is not the whole picture. There are large and potentially dangerous snakes in this group, but smaller, docile members of the family can make engaging pets. Some are quite curious, active and easily tamed. Unfortunately, there have been a number of cases where large pythons have caused serious injury and even death to humans - both children and adults. While this has happened with very large constricting snakes, they are certainly isolated events. However, the risks exist, and proper education and precautions are necessary to prevent tragic incidents. Do not buy an apparently unhealthy snake, and if you have snakes at home already, quarantine a new arrival for a minimum of 3 to 6 months (and always be sure to wash hands between handling snakes). A length of eight feet is often recognized as a safety threshold; any snake that reaches an adult length of more than eight feet requires a very secure enclosure and experts often recommended that two people be present to handle such large snakes. In fact, is is a good idea to have one handler for each four feet of snake; for example, three people to handle a 12-foot snake and four people for a 16-foot snake. Feeding is a vulnerable time for owners of large snakes and it is recommended that there at least be another person present when feeding to assist if necessary. (Most constricting snakes only eat once every 10 to 14 days). Other important considerations, other than size, include the source, the needs of the animals, and housing depending on the species. There is a significant variation in the care and housing arrangements among the different species. The general rule about feeding any breed of snake is to avoid giving prey items larger than the snake's widest body part. While you should never feed boas or pythons by hand, you also should avoid handling it for at least a day after it has eaten. There's a strong chance of regurgitation if the snake isn't given sufficient time to digest its prey. Most boas and pythons prefer to hide while eating their prey. Their enclosures should have hide boxes for this purpose; you can expect your pet constrictor to disappear into a hide area during meal time and for a day or two afterward. If you have the space and the resources, many experts recommend feeding large snakes in a different enclosure than their home cage. That way, they tend to associate feeding only with the feeding cage, and are less likely to approach a person entering the home cage. Burmese pythons are generally gentle but they are extremely large and powerful snakes. They're among the most popular breed kept as pets, but it's important to note that even Burmese have been involved in fatal incidents. Red tailed boas (commonly known as boa constrictors) are not as large but are still powerful and not recommended for beginners. Reticulated pythons grow very large and have a reputation for nasty temperament; they are only suitable for very experienced handlers if they're kept at all. Reticulated pythons are the longest snakes in the world and are good swimmers. Captive-bred snakes are preferable to wild caught since captive-bred snakes usually are more tame, less nervous, less stressed and have fewer diseases. It may also be easier to feed them, especially with killed prey. 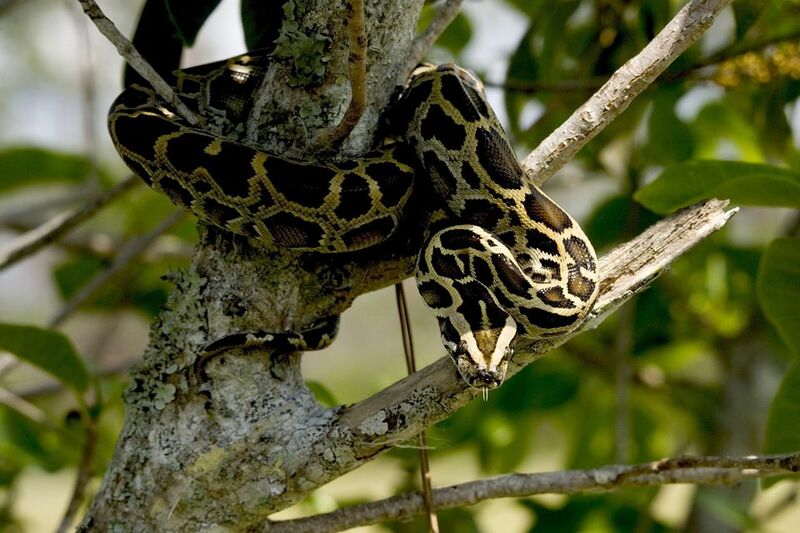 Tree pythons and boas tend to have stricter needs for housing and humidity/environmental control; they they can be more of a challenge than the terrestrial species. The best constricting snake for beginners is the ball python, though these are somewhat notorious for refusing to feed in captivity: ensure your snake is captive bred and, if possible, ask the seller to demonstrate how it feeds. Also consider the longevity of the snake: a healthy ball python, for example, can be expected to live 30 to 40 years. All of these snakes are carnivores, and most experts recommend that you feed killed prey. Not only is it easier on the owner, but there is no risk of the snake being bitten or otherwise injured by the prey; a mouse or rat can inflict significant injury on a snake if given the chance. Inclusion body disease is an important consideration with boids. This virus is fatal in pythons and boas who exhibit symptoms. It is impossible to tell for certain if a snake has been exposed (and some snakes are asymptomatic carriers), and it can take months for signs to appear. If a snake is showing symptoms of IBD, they may have difficulty shedding, anorexia, constipation, tremors, and loss of motor control. Many snakes with this disease starve to death because they can't digest any food. Constrictors, like many other reptiles, also are susceptible to respiratory infections and mouth rot, or stomatitis. Mouth rot will show as a reddish discoloration around and in the animal's mouth. A snake with a respiratory infection will breathe with its mouth open or wheeze. All of these conditions should be treated by a veterinarian who has expertise in reptiles, ideally one experienced with constrictors. If you are determined to have a constrictor as a pet, there are a few breeds you may want to consider that are better suited to captivity. For an overview of pythons, boas and other snakes, check out our profiles of other snake breeds.